Rhodococcus sp. I24 is able to utilize naphthalene and toluene as carbon sources, and to co-oxidize indene. The naphthalene inducible genes nidABCD (Fig. 7) coding for naphthalene dioxygenase, a dehydrogenase, and a putative aldolase (Treadway et al. 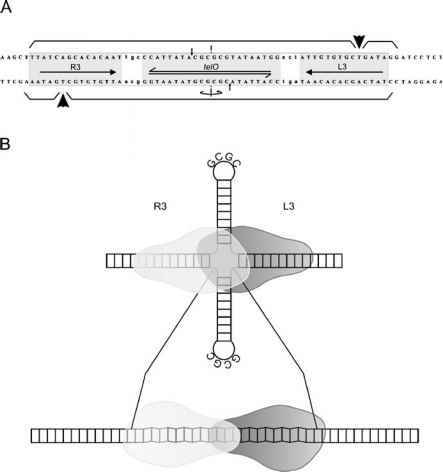 1999) reside on an 80-kb plasmid (AF45237.2; Priefert et al. 2004) (Table 1). 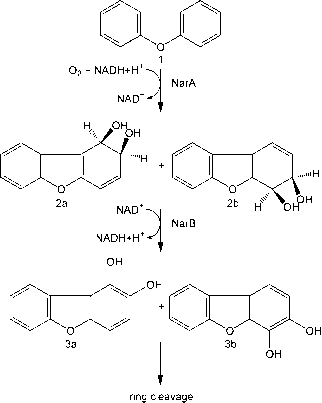 Common initial steps in naphthalene degradation by Rhodococcus sp. strains NCIMB12038, P200, and P400 likewise involve formation of the cis-naphthalene dihydrodiol, catalyzed by naphthalene dioxygenase (NarA), and re-aromatization to dihydroxynaphthalene by cis-naphthalene dihydrodiol dehydrogenase (NarB). The nar gene clusters have different genomic locations. In Rhodococcus sp. NCIMB12038, it is located on the linear plasmid p2SL1 (Table 1). Strain P200 contains a linear 300-kb plasmid termed P20L1 and a circular 150-kb plasmid; however, the nar genes appear to be chromosomally located. Strain P400 contains two linear and two circular plasmids (Table 1); copies of the nar genes were identified on the 180-kb circular plasmid P40C1 as well as on a smaller linear plasmid (P40L2 or P40L3) (Kulakov et al. 2005). Significant similarity exists between the nar/nid/rno genes of strains NCIMB12038, P200, P400, I24, and Rhocococcus sp. CIR2. The products of the narA and narB genes of P200 and P400, for example, show 88-99% identity to the corresponding proteins of NCIMB12038. However, the presence of intervening nonhomol-ogous regions and possible deletions or insertions suggests that nar genes have been arranged in several "modules". The central module consists of the narAaAbB/nidABC/rno(A2A3)A4B genes, which are present in the same order in all strains (Fig. 7). Putative genes coding for a hydratase-aldolase (narC, nidD) located downstream of narAaAbB/nidABC were identified in strains I24, P200, and P400, whereas NCIMB12038 and CIR2 lack narC (but contain a short remnant of its 5' region). The naphthalene degradation genes of the linear plasmid p2SL1 of strain NCIMB12038 have highly homologous counterparts in R. opacus strain R7 (DQ846881); however, the rub and narR genes are arranged differently (Fig. 7), and the location of the gene cluster in the genome of strain R7 is not clear. R. opacus strain TKN14, which is able to degrade o-xylene, contains nid genes that are arranged like the rub1 and nar genes of strains P200 and P400, and the corresponding genes of strain I24 (Fig. 7) (Maruyama et al. 2005). However, it is not yet known whether the nid locus of strain TKN14 is part of a plasmid or the chromosome. R. opacus SAOIOI is able to utilize dibenzo-p-dioxin and dibenzofuran as sole sources of carbon and energy, and also grows on other aromatic compounds like naphthalene, biphenyl, dibenzothiophene, toluene, phenol, (chloro)benzene, and p-nitrophenol (Kimura and Urushigawa 2001; Kitagawa et al. 2004). This organism contains three large linear plasmids pWK301, pWK302, and pWK303 (Table 1) (Kitagawa et al. 2004). Oxidation of dibenzofuran by strain SA0101 proceeds via lateral dioxygenation at the 1,2- and 3,4-positions to form the corresponding cis-dihydrodiols (Fig. 8). This ability appears to be due to the relaxed substrate specificity of the oxygenase component (NarA) of its ring-hydroxylating dioxygenase, which catalyzes the oxygenation of naphthalene, dibenzofuran, dibenzo-p-dioxin, phenanthrene, and biphenyl. The nar cluster (Fig. 7) is located on the 1100-bp linear plas-mid pWK301 and is induced in the presence of dibenzofuran (Kimura et al. 2006). The deduced NarAaAb proteins show 97-98% sequence identity to the naphthalene-inducible dioxygenase NidAB of Rhodococcus sp. strain I24. The gene organization of the catabolic gene cluster of strain SA0101 closely resembles that of gene clusters of Rhodococcus sp. P200, P400, TKN14, and I24 (Fig. 7). 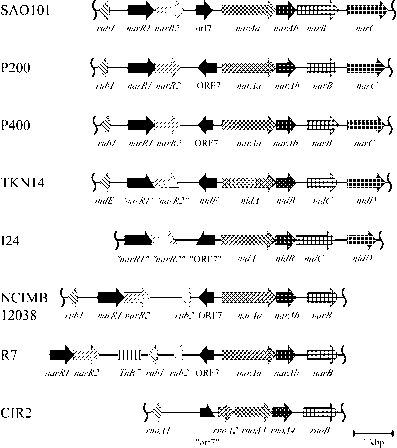 R. opacus M213, another naphthalene degrader, was proposed to contain two plasmids pNU01 and pNU02 (Table 1). The linear plasmid pNU01 carries a catechol 2,3-dioxygenase gene edoD; however, the role of the pNUO plasmids in naphthalene degradation is at present not known (Uz et al. 2000). The patterns of homologous regions, and some differences in localization and organization of the genes depicted in Fig. 7, suggest that genetic exchange and genomic rearrangements had occurred within the nar gene clusters. The presence of deletions, intervening nonhomologous regions, and (partial) transposase sequences within the nar regions is also indicative of DNA shuffling during evolution of the nar regions (Kulakov et al. 2005; Kimura et al. 2006).